The “law” that has defined the digital age faces a fundamental limit; what happens when we reach it? Consumer technology generally progresses according to three criteria: size, speed, and convenience. It must be small, fast, and easy. If it fails to satisfy these demands, it flops. Because of this, we've come to expect a consistent flow of breathtaking innovation. But where is the limit? Is there a size or speed beyond which science cannot attain? Some say Moore’s Law is that limit—or, at least, a very formidable barrier. Moore’s Law was conceived by Intel co-founder Gordon Moore in the mid-1960’s. While not quite a “law” in the scientific sense, the phenomenon claims that the number of transistors that can fit into a single microchip, or integrated circuit, doubles roughly every 18 months. Transistors are, essentially, the on/off switches that make up the ones and zeros of binary code, with each transistor representing one “bit” of information. The effect of this is a rapid increase in computing power within ever smaller devices—“memory density,” as it’s known. The iPhone is roughly 16,000 times more powerful than the Apollo 11 computer. You can understand it like this: The total computing power of NASA’s Apollo 11 mission was roughly 64 Kbyte of RAM at a speed of 0.043MHz. The iPhone 5, by comparison, utilizes 1 Gb RAM at 1.02 Ghz. That’s a growth factor of more than 16,000. Now think about the progress of consumer technology throughout the 20th century: Transistor radios replaced vacuum tubes; digital cameras replaced film; CD players and, eventually, MP3s replaced record players—even dishwashers and refrigerators have been “digitized.” These advances were made possible by improving memory density. 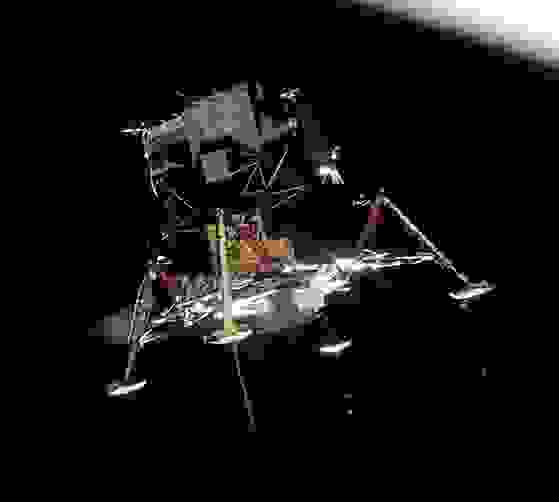 Your phone is smarter than the Apollo 11 Lunar Module. While this explosion of computing power is at the heart of modern technology—and the reason for the size, speed, and convenience phenomenon described above—it’s important to recognize that this near-exponential growth is merely a perception; there is no self-sustaining constant guiding the exponential accumulation of transistors in a microchip. In fact, due to the engineering challenge of manufacturing ever smaller transistors, chip-makers like Intel have taken to using Moore’s Law as a mere blueprint for future innovation. Now, however, manufacturers are running up against a huge wall—or, more accurately, a tiny wall. Whereas transistors of the 1960’s were roughly half an inch in length, today’s transistors are in the range of 22 to 30 nanometers (nm)—roughly one-fifth the size of the smallest known bacterium. Clearly, it’s becoming more and more difficult to manufacture at this scale. Gordon Moore himself predicted in 2005 that this obstacle would cause a plateau in the yearly increase in memory density. Anyone born before 1990 might recall how computer performance used to improve some 50 percent on a year-to-year basis. Recently, that figure has shrunk to a point where a personal computer built in 2011 is only marginally slower than one built in 2013—which may be good for consumers looking to stay on top of technology without buying a new computer every year, but bad for the growing demands of an information-fueled world. 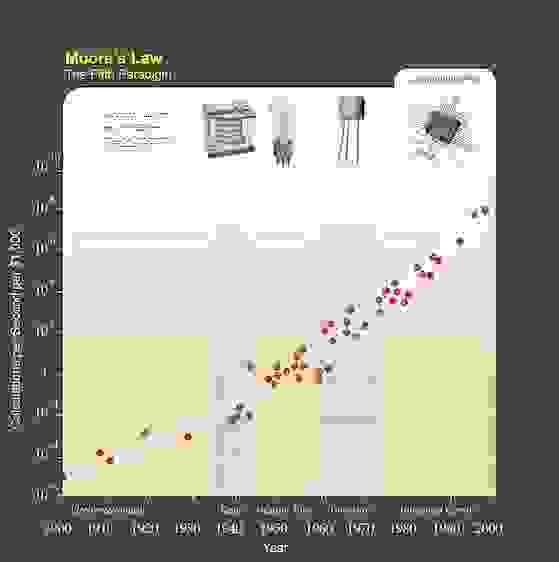 Futurist Ray Kurweil's illustration of Moore's Law through the 20th century. Concern over an “expiration date” for Moore’s Law has existed since the 1990’s, and even Moore seems to have expressed some alarm. The New York Times ran an article about this very problem in 1997, when transistors were about 300 nm in length. Now, Intel is on track to begin producing 14 nm processors later this year. For perspective, 14 nm is roughly the width of a bacterial cell wall. While these advances have required massive investments in research and development, Moore’s Law has remained more or less on target. The only question is, what about that fundamental barrier: the atom? Physics does not account for the manufacture of transistors smaller than an atom. As Moore stated, the atom is the end of the line for memory density; physics simply does not account for the manufacture of transistors smaller than that. However, the creation of objects equal in size is fair game, and has already been achieved. Last year, a team of researchers at the University of New South Wales in New Zealand successfully built the world’s smallest working transistor: a single phosphorus atom embedded in a silicon crystal. This is leaps and bounds ahead of most targets, which state that transistors of atomic mass must be operational by 2020. More importantly, though, it marks the fulfillment of Moore’s Law. But what will this mean for technology? Will computing power stagnate once atom-size transistors find their way into products? Will data storage become more expensive? How can we expect to process the massive volume of global information—which truly is exponential, unlike Moore’s Law—when processing power has a fundamental limit? The problem with atomic transistors is that their fundamental size renders them unreliable for reproducing the millions of ones and zeros that work together to create a binary computer program. This is at the heart of the branch of physics known as quantum mechanics. At such diminutive scales, electrons—which make up the electrical signals that run through transistors—are random and indecipherable. It may be possible to build a computer that is not limited to a binary switch of ones and zeros. However, it may be possible to use the bizarre nature of quantum mechanics to our advantage; it may be possible to build a computer that is not limited to a binary switch of ones and zeros (bits), but rather a one, a zero, or both a one and a zero at the same time—as well as anything in between. These units of information are called quantum bits, or “qubits,” and are immensely powerful due to their non-linearity—they can branch off into multiple simultaneous calculations, whereas binary computers can only accomplish one at a time. Think of it this way: If binary computing is the internal combustion engine, quantum computing is nuclear fusion. Some quantum computers have already been built, but their applications are extremely limited. To date, the largest ever quantum computation was an 84-qubit calculation conducted by a Vancouver-based company called D-Wave. While the calculation in question was extremely difficult and solved in a mere 270 milliseconds, the computer that answered it costs $10 million. Furthermore, quantum computing would require an entirely different approach to programming—much like asking a car mechanic to fix a space shuttle. The point, though, is that quantum computing is increasingly becoming a reality, and as yet is the only technology capable of bearing the torch handed off by binary computing. Moore’s Law faces an expiration date, a point at which memory density will hit a physical limit. But if quantum computing is successful, Moore’s Law will be rendered obsolete—just an archaic prototype of early computer theory.